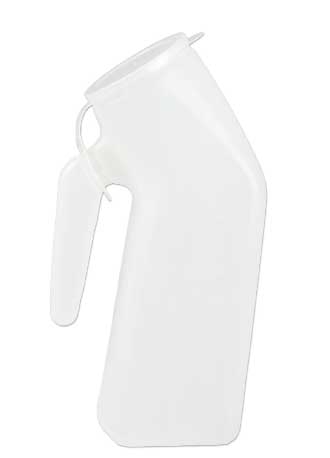 The Deluxe Portable Male Urinal with Hanging Lid is a 1 quart (1000cc) plastic urinal. It is translucent for ease in measuring and are graduated on three sides for easy to read volume measurements. Graduations are in 1 oz (25 mL graduations). They are specially designed with notched handle that conveniently hangs on most styles and sizes of bedrails. The handle is a separate chamber and will not fill during use. It features a wide base which improves standing stability, empty or full. Pronounced neck angle helps confine contents when urinal is positioned horizontally.